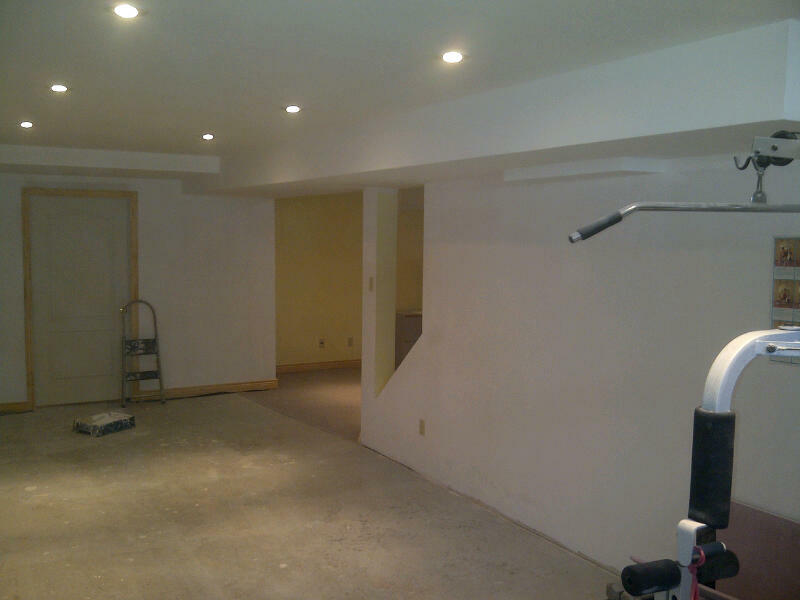 Bernie and Pat’s children are grown up, so the couple are renovating their 1,500 sq ft Nepean basement in preparation to sell the home. For the past four years I’ve volunteered at the Royal Ottawa Mental Health Centre Christmas tree sale. Bernie volunteers on the Christmas Tree Sale committee and that’s how we met. 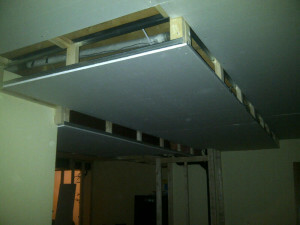 The basement ceilings are 8-feet high. 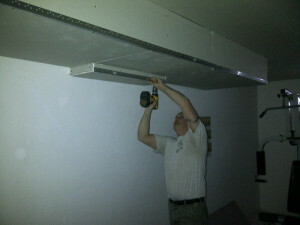 A drywalled basement ceiling needs to be 6’11” to meet code. Day 2: Framing around ceiling ducts and pipes. Day 1: We’re starting Bernie’s basement renovation. Exterior walls are already finished. We’ll be creating a storage room, gym and living area. 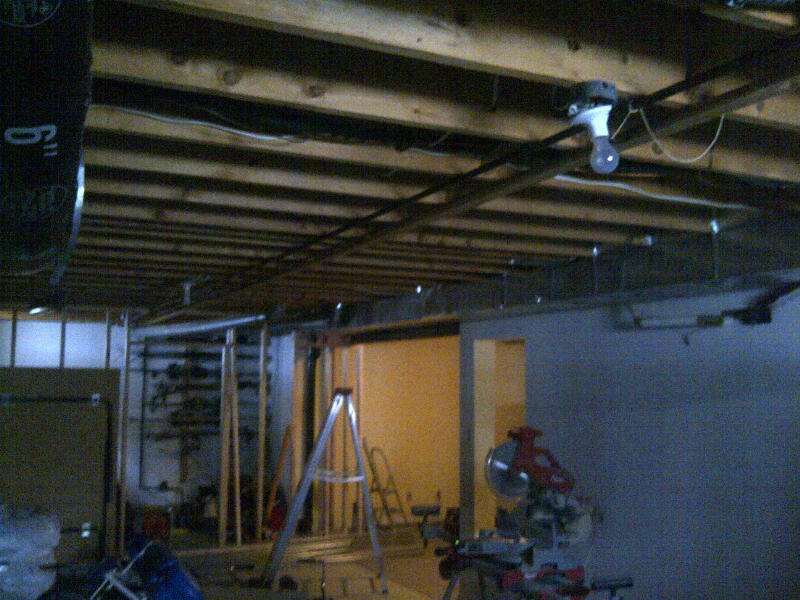 Day 2: We’re strapping and framing the ceiling. 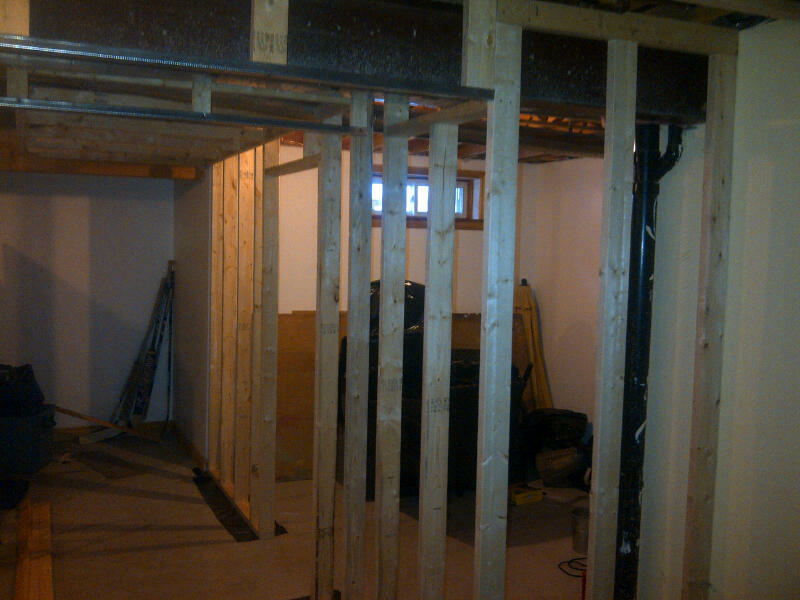 The pipes, ducts and I-beam paths call for a two-level bulkhead. Ceiling strapping is usually done with 1x3s, but to keep the ceiling as high as possible and avoid the gas and water pipes when screwing in drywall, we used 2x3s instead. 60 2x3s were used. Reminds me up the multi-level ceiling we did in Drew and Lisa’s Westboro basement. Day 4: created storage room with wide doorway. 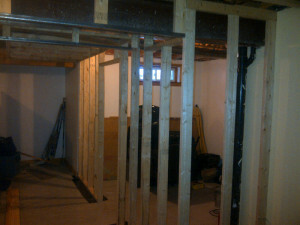 Day 4: Framing and strapping complete. 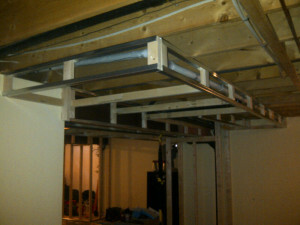 We’ve framed the storage room, main plumbing stack and all seven bulkheads. The storage room doorway is 36″ wide so they can get larger items in. 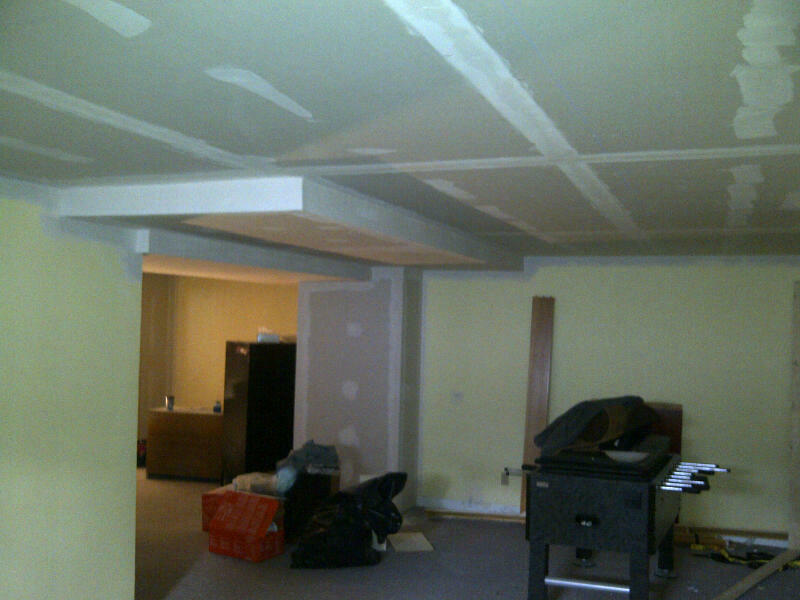 Day 6: 48 sheets of 4’x8′ drywall were delivered yesterday for the walls and ceiling. 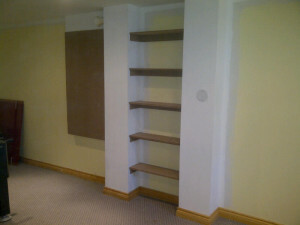 Larger sheets wouldn’t fit down the basement stairs. We rented a lift to help with the ceiling pieces. 200 feet of mesh tape. Day 8: Installing a whopping 450 feet of paper tape, 260 feet of metal corner bead and 200 feet of mesh tape. That easily beats our previous record of 400 feet of corner tape in Drew and and Lisa’s Westboro basement. Day 10: all seams and corners are mudded. Day 10: With all of those edges and seams, you can imagine how much mudding is going on. Day 12. And then we sanded. 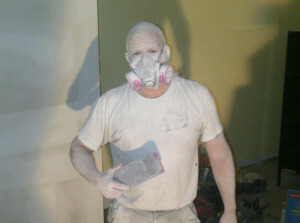 Day 12: And then we sanded. “Paul and Don did a great job. The ceiling and storage space look especially great. 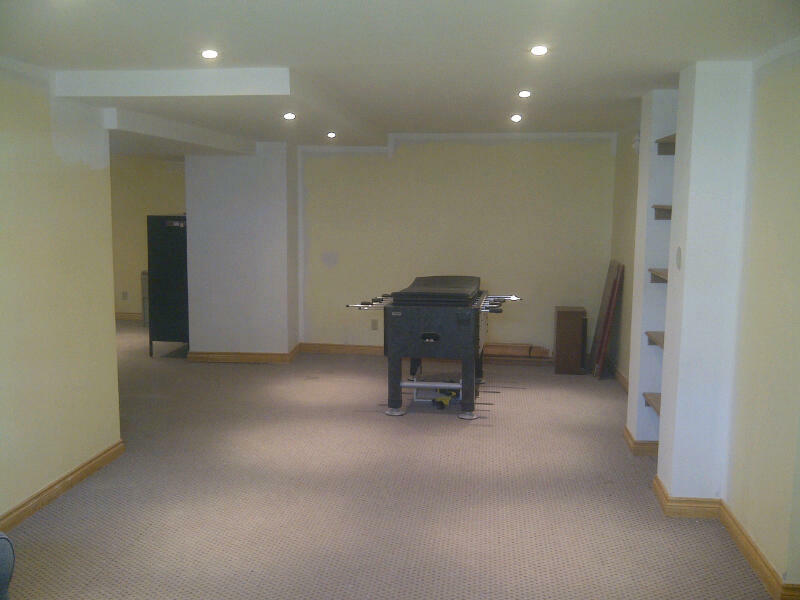 Completed basement. This shelving unit covers pipes.